EPA Chief Gina McCarthy sniffs that she won’t be attending a Senate hearing in Arizona this week on the agency’s massive whoopsy dump into the Animas River, because she didn’t receive an invitation. Memo to Ms. McCarthy: That legal-looking document that is being delivered to you by the official looking dude or dudette from the Senate Sergeant at Arms office is called a subpoena. It’s even better than an invitation, because it actually demands your presence at said event. “Communities want to know if their families will be safe,” Barrasso told her, adding that residents in Arizona and Colorado — where EPA workers caused a massive mine blowout in August — are angry with the agency. 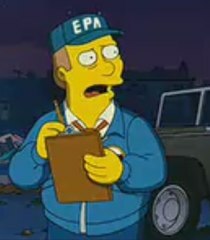 “EPA stands for the Environmental Polluting Agency,” he said, referring to what some residents in the southwestern U.S. now call the agency. McCarthy will instead be sending a faceless bureaucrat to face angry residents and politicians to avoid answering any questions and to hedge on taking full responsibility for the disaster they caused in August.